When South Korean activist Chun Ki Won got into a taxi near China's border with Mongolia on a cold evening last December, he thought he could relax, his work done. The 12 North Korean refugees he was spiriting out of China, including a pregnant woman, seemed safely on their way to South Korea. The night did not end as planned. Chun was arrested, probably turned in by his taxi driver for the bounty offered by China to citizens who denounce North Korean refugees and the missionaries and aid workers who assist them in their escape. Chun Ki Won, released So. Korean activist, with Tim Peters at Incheon Airport. The return of evangelist Chun Ki Won after only 8 months of imprisonment in a Chinese prison in Inner Mongolia was a wonderful answer to prayer, one that required us putting feet to our prayers! In May, a couple of us had been called to Washington to testify to the U.S. Senate about the plight of North Korean refugees, at which time we highlighted the case of 200 foreign missionaries detained in China for aiding North Korean refugees, Chun Ki Won included. In June, Congress passed -- by a phenomenal margin (406-0) -- a very strongly worded resolution regarding North Korean refugees in China, and activists being detained there. By late August, Chun was released. I worked with Chun in China, and was all too aware of how the Chinese government took care of those held in detention. As I expected, Chun was given the equivalent of one piece of coarse wheat bread per day, deprived of sleep and forced to clean all the prison toilets. The fate of the North Korean refugees --who now number 13 with the baby's birth-remain uncertain though we suspect that some are still in detention in China, while some may have been sent back to North Korea. This unfortunate but all too familiar story adds, as one journalist puts it, " to the growing sense of tragedy and confusion that surrounds the many desperate attempts by North Koreans to escape their failing country, which is fraught with food shortages and controlled by a paranoid regime. Thank God the story is beginning to get out. ABC Nightline recently featured an award-winning documentary on the plight of North Korea's food refugees, with viewer response unprecedented in Nightline's 20-year history. Tim Peters with young refugees. U.S. Missionary and Ton-A-Month founder Tim Peters loads relief supplies with the help of daughter Rachel. Helping Hands Korea is a Christian mission in Seoul that was founded in 1990. In October of 1996, Helping Hands Korea largely shifted their focus from projects in South Korea to North Korea, their first program being the Ton-a-Month Club. This involves rallying donations from concerned South Koreans and expatriates in order to purchase one ton per month of desperately needed grain (rice, corn, millet etc), to send as famine-relief to the North Korean civilian population each month. In addition to Helping Hands Korea helping malnourished North Koreans in their hometowns, HHK also actively addresses the needs of runaway N. Korean children. By supporting a number of "secret orphanages" for North Korean children in China, and food production operations in N. Korea, they have the double advantage of being able to enhance the quality of monitoring of the aid given, as well as receiving direct feedback from recipients. In January 2002, Helping Hands Korea was mentioned in a presentation before the US Commission on International Religious Freedom in Washington DC. In May 2002, FCF Project Manager Tim Peters was asked to speak before Congress, along with other experts on the North Korean situation. In June, Congress passed by a phenomenal margin (406-0) a very strongly worded Resolution regarding North Korean refugees in China, and activists being detained there. 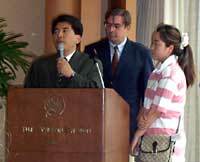 The daughter (right) of imprisoned N. Korean activist Chun Ki Won stepping up to the podium to speak at a press conference held at silent auction organized by Tim Peters (center). Click on links at right to hear interviews with Tim Peters and Dr. Norbert Vollertsen, a German physician who lived in North Korea for 18 months, which present an overview of the deplorable conditions in North Korea (NK), and the efforts being made on behalf of NK refugees. If you would like to make a donation to this project, click here. 300,000 North Koreans have defected to China, risking their lives to flee the mass starvation and brutal oppression of Kim Jong Il’s Stalinist regime. Sadly, Beijing’s official policy is to arrest the refugees and forcibly return them to North Korea, where they face imprisonment, torture and in some cases execution. border to China, which doesn't recognize the desperate invaders as refugees. responsibility to these N. Korean refugees. "China is offering bounty payments to its citizens who denounce North Korean refugees, and the missionaries and aid workers helping them seek asylum in foreign embassies," says human rights activist Tim Peters. “Almost every day, they're arresting North Koreans and sending them back to brutal persecution," says Kim Sang Hun, a refugee activist in Seoul. “The critics ought to talk to the refugees,” said Tim Peters. “It’s easy for scholars to make statements, but I wonder how much they know about their suffering." Years of danger and struggles against famine have ended for the 25 North Korean defectors who arrived in Seoul yesterday afternoon. Driven by famine, hundreds of thousands of North Koreans have fled to China, where they live in hiding. HHK channels financial help to a bread factory in the provincial N. Korean capital of Chongjin, Hamkyoungpukto, operated by a friend of ours.At present, 856 middle school orphans are being fed 4 large biscuits per day through this effort. Additionally we support a grassroots Caprine Diary operation in North Korea, run by a US Korean, which provides goats' milk and soy milk products to malnourished North Koreans. In collaboration with the Foreign Correspondents’ Club, Helping Hands Korea presented “An Evening with North Korean Refugees.” During dinner a packed dining room watched excerpts from Ms. Kim Jung-eun’s internationally recognized and awarded video documentary, Hidden Lives, a riveting journal presented four times in 2002 on ABC News Nightline of the tragic plight of North Korean refugees in China. (b) emergency support for North Koreans living in extreme danger in China. Three former North Korean refugees then shared with the audience their heartbreaking testimonies of life inside North Korea’s reign of terror and the desperate circumstances they face in eluding manhunts by Chinese police. The hauntingly sweet songs by former North Korean refugee, as she accompanies herself on the ancient Korean instrument the kayageum, reminded everyone of the sadness that resides in the heart of every North Korean until all their people are rescued from hunger and tyranny. The three testimonies given by recently-arrived refugees were ably translated by our longtime friend and ally in efforts to rescue North Koreans, Mr. Kim Sang-hun. Mr. Kim Sang-hun was recently honored by TIME magazine (April 28th, 2003) as one of its Asian Heroes for 2003. Throughout the evening, local artists exhibited their original art, which turned out to be the most successful source of charity fundraising that evening. Musical headliners from Ireland Andrea Rice & Fee Dobbin were the featured musicians for the evening’s program. Participating in a protest rally in front of Chinese Embassy in Washington DC, calling on Chinese authorities to honor their obligations to hunger refugees fleeing North Korea. Tim with fellow activists Hwang Jeong Yop, the highest level government official to have ever defected from the North Korean regime, and Dr. Norbert Vollertsen. Tim Peters of Helping Hands Korea joined Japanese activist Hiroshi Kato (recently released from a Chinese prison), Kim Sang Hun (senior activist in the underground railroad for the refugees), and Dr. Norbert Vollertsen, to visit the regional UNHCR office in Tokyo. They delivered a letter pointing out the UNHCR’s failure to live up to its mandate in China to protect North Korean refugees. Helping Hands Korea continued its monthly commitment to Schindler’s Club, aptly named to describe the work of funding and assisting in the rescue of N. Korean refugees. Tim participated in a press conference in the Foreign Correspondents Club in Japan regarding the attempt to evacuate the North Korean refugee “boat people” from China to South Korea. Tim’s comments on the plight of North Korean refugees and their persecution were covered by the New York Times, USA TODAY and other major media, both print and TV. Tim undertook a fascinating five-day fact-finding trip to Mongolia with two others to scout out the potential for a new initiative that would safely bring more North Korean refugees to safety from peril in China. Due to various propitious circumstances and introductions, I (Tim) was able to have private meetings with the State Secretary (Vice Minister) of the Mongolian Foreign Ministry and the new Korean ambassador to Mongolia, as well as the resident representative of the Asia Foundation. During a two day trip to the south of Ulan Baator, we drove a total of 30 hours in a rugged rented Russian van to explore the possibilities of renovating abandoned apartment blocks (see photo) from the Soviet era to house an influx of N. Korean refugees that many of us feel are assuredly coming. I had written about this possibility almost three years ago in a grant proposal entitled Operation Underground Railroad, so it was particularly fascinating for me to see these building personally and realize that the foundations and structures are strong although vandalism has been responsible for all the windows being broken and the insides of the apartments' being torn up. Nevertheless, it would be quite economical to get them livable in a relatively short time. Another aid trip was made to the PRC side of the North Korean border, Tim leading two young mission-minded Americans to the area, who are considering greater involvement in assisting refugees.It was also a chance to gauge the tense situation on the border, give donations to projects that assist in feeding NK middle school orphans, as well as to those helping refugees in China. Tim made a four-day trip from Seoul to the China/North Korean border area with members of another NGO to provide direct aid to 22 newly arrived refugees. The key part of our assistance was to find and rent two apartments for a period of three months to give temporary shelter to the refugees in the coldest months, and getting them set up with winter clothing, blankets, kitchen utensils, portable gas ranges and sundries. We briefed various Ambassadors to Korea with a general overview of the NK refugee situation in China and conditions near the China/NK border. Helping Hands Korea donated four months’ worth of its ton-a-month benchmark to Pastor H., who promised to use it to nourish the famished members of the underground church inside North Korea, to which he has extraordinary access. This month we also successfully coordinated a shipment donated by a Christian group in Seattle, WA of 100,000 jars of baby food and 426 pieces of medical supplies. Coordination included transshipment and re-packing of goods to a different container in a South Korea port. The most challenging part of this task was designating a recipient for the food & medical aid in North Korea. Our good friend, a Korean Christian in China, stepped forward and valiantly agreed to the difficult task, made all the harder by a 10 day SARS quarantine established by the North Korean government. Thanks to much prayer on all sides, 70% of the baby food and medicine reached the needy mining city of Musan and the other 30% was trucked to Chongjin, another impoverished city in the northeast. A charity concert dubbed "Famine for Love" was held in the Munhwa Ilbo concert hall in Sodaemun featuring internationally recognized classical pianist, Sam Rotman, and well-known Korean soprano and professor of voice, Chang Sun Kyung. The concert was sponsored by Ton-a-Month Club, with proceeds used to feed and provide winter clothes for North Korean children who have fled North Korea into the adjoining provinces of China. We rely upon a varied group of donors to make our work possible. Elementary school children and their teacher from a US military base in Kyushu, Japan collected and sent to the Ton-a-Month Club a check amounting to $600 to help relieve hunger among children in North Korea after seeing a front-page article about our work in the Sunday edition of Pacific Stars and Stripes newspaper. A CBS correspondent stationed in Korea, and a member of the Ton-a-Month Club for over a year, handed us $500 for famine relief. To our surprise, he explained that his participation in Ton a Month Club assisted him in obtaining a key position at UNICEF in the Congo for which he'll be leaving this week. A Korean tailor and devoted Christian friend recently gave us an envelope containing about $88 for famine relief when we dropped by to see him. A Michigan community newspaper entitled Mature Michiganians that reaches people in the 50 plus age range carried a full description of our Ton-a-Month program under the title "Missionary to North Korea asks for help from locals". A major South Korean TV broadcasting station, MBC, interviewed Tim about ways Korea can improve its volunteer programs and Ton-a-Month Club was mentioned as one of our projects. The Korea Herald has printed a number of articles about the Ton-a-Month Club, plus stories featuring fact-finding missions taken by Tim and another volunteer to the North Korean/China border. Approximately 6 tons' worth of donations were given in response to these articles. [In March 2002, twenty-four North Korean (NK) refugees successfully took asylum in the Spanish Embassy in Beijing. In the weeks to follow, a highly coordinated international effort amongst NGO’s was successful in assisting these NK refugees to find their way from China to freedom in South Korea. The refugees, including two orphans, had been so desperate that they carried poison on their person in the event that, if caught, the Chinese authorities would repatriate them to North Korea. Below if the original statement they made to the world community. Today we stand before you, 24 North Koreans refugees, driven together by danger and desperation. We are seven families and two orphan girls, 6 of which are children. At separate times in 2001 we defected from North Korea in search of food and freedom from oppression. Most of us were caught by Chinese security officials and were then subjected to forced deportation to North Korea. After repatriation, we endured months of detention in North Korea that can only be described as atrocious. As time went on, each of us seized the first opportunity to escape to China again. 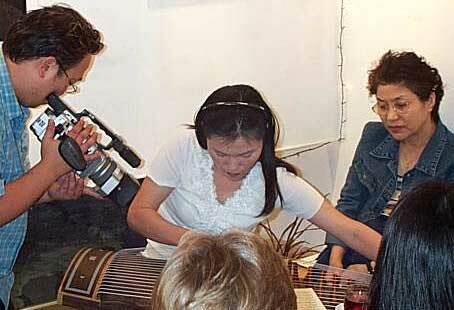 At present we have come from several different locations in China with the help of foreigners. We wholeheartedly thank them for their vital humanitarian help to our plight. If we are to be forcefully repatriated to North Korea by the Chinese government yet again, without doubt, our lives will be in the greatest possible jeopardy. Moreover, there is no doubt in our minds that our freedoms in North Korea will be denied in light of the record of our earlier defections and this current attempt to go to South Korea. Yet we believe we are fully within our rights under universally recognized international law. Our individual bio-data and testimonies of persecution experienced in North Korea are attached herewith. We are now at the point of such desperation and live in such fear of persecution within North Korea that we have come to the decision to risk our lives for freedom rather than passively await our doom. Some of us carry poison on our person to commit suicide if the Chinese authorities choose once again to send us back to North Korea. All 24 of us seek, above all else, to apply for refugee status. However, the current practice of the Chinese local authorities to carry out unconditional and forced repatriation of North Korean defectors and the subsequent persecution by the state has forced us to seek help from the international community. For this purpose, we have entered the Embassy for assistance. Many of us find it necessary to conceal our identities for fear of dangerous repercussions to our loved ones who remain in North Korea. For the same reason, we respectfully request that our pictures not be taken. The only power we have left is to appeal to you on our knees and with tears. If you would like to support this or other Family Care Foundation Projects, click here.